“Before Elegant Jaw” discovered around 1913 in Württemberg, Germany, described & named in 1913 by Eberhard Fraas. 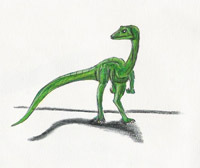 Procompsognathus lived during the Late Triassic Period about 222 to 219 million years ago. 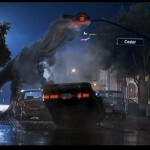 It was 1.2 meters (3.8 feet) in length, 26 centimeters (10 inches) in height, & 2.2 pounds (1 kilogram) in weight. Presently there is no evidence to say that Procompsognathus had five fingers or four fingers like its more contemporary relative, Segisaurus halli and other ceolophysids. For now it is presumed that the Procompsognathus featured in the novels is a mutant or a similar genetically modified animal. Procompsognathus was one of the species that reached the mainland from Isla Nublar. It was commonly misidentified as a Basilisk lizard. While visiting Costa Rica with her brother and parents, Tina Bowman was attacked by a Procompsognathus on the beach. The doctor they visited, Marty Guitierrez, believed it to be a basilisk at first based on her description, but later was unsure when he retrieved a half-eaten specimen from a howler monkey. On Isla Nublar, it was discovered that the small dinosaurs actually contained a type of toxin in their saliva which was akin to morphine, drugging the victim, having been made known when one of the keepers was bitten. Years later on Isla Sorna, Procompsognathus was seen eating the dung expelled from a herd of Maiasaura.